Your search for the best knife sharpener is finally over. When you purchase your Samsali. Inspirations Knife Sharpener today, here are just some of the things you can look forward to. A quality knife sharpener that will do the job properly every time. Compact and easy to use design. Non slip handle and base to ensure your safety and ease of use. 2 sharpening modes to get a bright edge whatever the condition of your knife. Not suitable for serrated edge knives, ceramic knives, or scissors. Most important though is the customer service that you will receive when you place your order today. Try it today and if you’re not completely satisfied you know you’re protected by our 100% no questions asked – Money Back Guarantee. Bonus Free Recipe Book. As a special bonus, with every one of our knife sharpeners purchased, you’ll receive our “101 Quick & Easy Recipes” valued at $9.95. 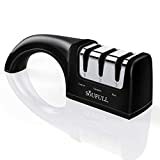 You’ll love the design of this high quality knife sharpener. It’s comfortable to hold, and it’s easy and safe to use. It’s good to sharpen most knives, and gives them a super bright edge to slice through anything in your kitchen. The top rated, 2 stage sharpening system is excellent for repairing damaged or very blunt blades, and also to return a bright edge to your knives. When you order today, you’re protected by our no-questions asked, money back guarantee and world class customer service!